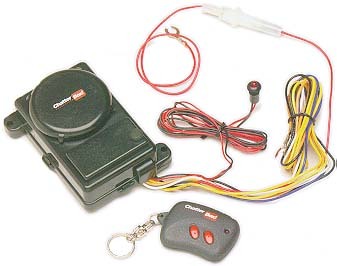 ChatterBox introduces the HJC-2002 Motorcycle Security System. A remote controlled alarm with a screaming self-contained 110db siren and an in-dash mounted LED to ward off potential thieves. The 2002 is so sophisticated it will even let you know if someone has tampered with your bike. For super convenience, we've added a vehicle locator function allowing you to pick your bike out of a crowd. With a low price, the ChatterBox HJC-2002 is absolutely the most full-featured alarm on the market. HJC-2002: Here's What You Get!